When I was a kid back in the 1970’s (please no jokes about how old I am- I’m well aware), there wasn’t the Internet to scare our parents and waste our time, cell phones were a distant reality, and I actually spent my time with good, ole family fun, as most of us did. We still drank water from the tap (and sometimes from the hose), knew our neighbors well enough to do more than just borrow eggs, and never had an organic piece of food cross our lips. Star Wars was all we talked about, Farrah Fawcett was on the wall of 56% of teen-aged boys bed rooms, and when we weren’t playing Frogger on our Nintendos or Intellivisions, we played board games for fun. Hearts stop but not the music. Yesterday on Valentine Day Sunday, in Los Angeles, a great heart stopped. A leading voice of 70s New Wave Music, Doug Fieger, Detroit native, singer, songwriter, died young at 57. 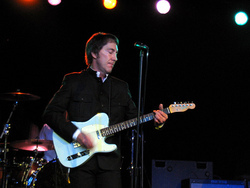 Doug Fieger led, and was the lead vocalist of the power pop band The Knack. He sung and co-wrote 1979 hit "My Sharona", the group's first single, an international #1 hit which spent six consecutive weeks at #1 on Billboard's Hot 100 in 1979, and was the biggest record of the year, a song that is and will always be a classic.